Shivanya got ready in her room. Yamini came and gave her necklace to wear. She denied. Yamini insisted and adorned in her neck imagining dorning it to nagin. She tightened thread. Shivanya said it was hurting. Yamini started emotional atyachar with fake tears and stated that her brother was alive, she saw her yesterday. She stated that her brother and Ankush killed icchadhari nagins for nagmani and nagin thought her to be a 5th murderer, but his brother was. Shivanya consoled her. Shesha came to Shivanya’s room to meet her but changed to Shivanya on seeing Rithik. He came to her and asked to go on a date and took her forcefully. Yamini ranged into the kitchen and saw Shivanya there and started conversing and saw Ritik going with another shivanya. She checked in the kitchen and realized she was real and thought that two nagin are smirking behind her son. Rithik took Shesha out and showed her a small car and said they are going in a romantic car. She hesitated and sat next to him. He drove and with brake she fell on him. He smiled and said he told her it was a romantic car and reached a jewelry shop and told the shopkeeper to show Antique piece for her. Rithik went to attend phone. Shesha changed her face. Jeweler saw and went out to tell rithik that she was not the same he came with. Rithik laughed and said that he came with only one wife. One man flirted and said wanted to kiss her lips, necks and shoulders. She kissed her and he died. Rithik came and she changed back. They both left. After reaching, she thought how shivanya would react. Rithik hugged her and tied her blouse lace. She started feeling for him. Sangram searched the book in haveli and was unable to find. Yamini went to her room and asked Ankush about the nagmani book. He took it out from secret safe and wondered why she needed. She told it would tell how to handle nagin. He said he saw some snake charmer in the market who took an oath to kill 100nag& nagins. She went to Shivanya and told her to bring grocery from the market. She agreed. Yamini followed her in 5th murderer dress. She called snake charmer who started playing bean. Shivanya got dizzy and turned to Nagin. Snake charmer caught her, and Yamini removed her mask and thought to see another nagin with Rithik. Rithik adorned necklace to Shesha. Shesha hoped Shivanya not to come. He came in front, and she changed back to shivanya, and he said let us sleep. She wondered how human, and nagin could sleep together. She asked what he needed. He asked her to hug and sleep as wanted to feel her. She slept next to him. Snake charmer tortured Shivanya and others and created a ring of fire. Her mangalsutra fell. She thought what disaster would come now. Shesha hugged Rithik and thought she didn’t have this feel till now. Shivanya called shesha. Shesha heard her plea and got, but rithik pulled her. She ignored her request and started feeling him again. 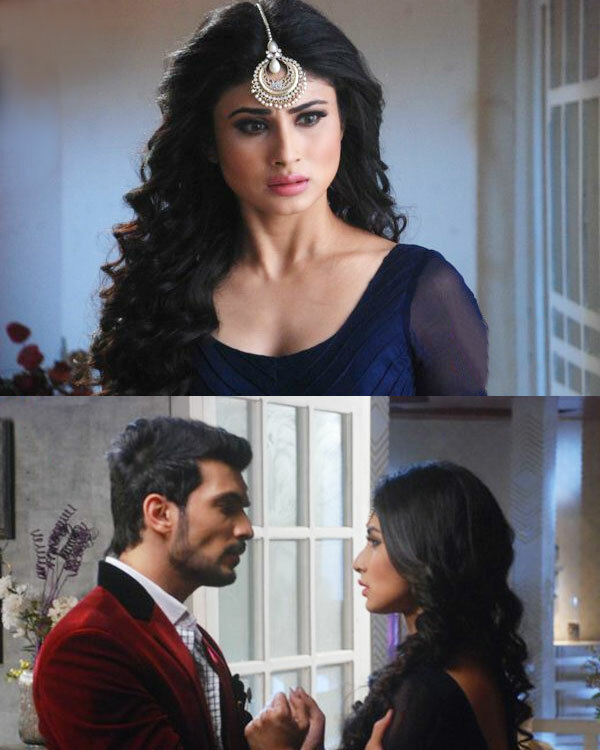 Stay tuned to The Reporter Times for latest Naagin news and updates. Don’t forget to share it on social media.